The Falcon 1 was an expendable launch vehicle developed privately by SpaceX. The rocket was launched for the time on March 24, 2006, with the vehicle failing 33 seconds into its maiden flight. Following three initial failures, the Falcon 1 became the first privately-developed liquid-fueled rocket to reach orbit on its fourth launch on September 28, 2008. The first stage of the Falcon 1 utilized a single LOX/RP-1 Merlin engine capable of 169 seconds of burn and 454 kN of thrust. The rocket’s second stage was powered by the now retired SpaceX Kestrel Engine. The upper-stage Kestrel engine was developed specifically for the Falcon 1 and was capable 378 seconds of burn and 31 kN of thrust. 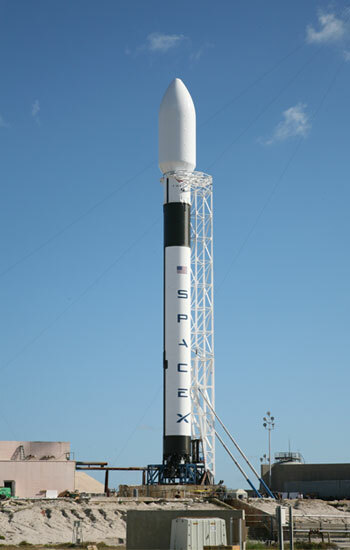 The Falcon 1 was launched for the last time on July 14, 2009. Following the launch, the Falcon 1 was decommissioned in favour of the Falcon 9. An upgraded version of the Falcon 1, the F1e had been planned to be launched for the first time in 2011. However, when the company moved away from the smaller variant in favour of the more capable Falcon 9 the upgraded Falcon 1 was abandoned.